Spring is in the air and with it conjures up visions of soft, pretty pinks and refreshing vibrant greens. I adore this time of year when my diary starts buzzing with newly engaged couples and brides on their final planning stages for their wedding. Feeling inspired by the season’s catwalk trends, pink is going to big news this year with the gorgeous Vera Wang fall 2014 bridal collection leading the way. Pink has also become popular with numerous celebrity brides over the past few years including Jessica Biel in a petal-pink Giambattista Valli, Anne Hathaway, Gwen Stefani and Reese Witherspoon, all opting for varying shades of pink for their big day. Pink is ultra feminine and dreamily romantic, so I wanted to share a pretty in pink wedding that was simply a vision of floral fabulousness. A gorgeous colour palette of pale pinks, creams and greens created the most beautiful English garden feel. 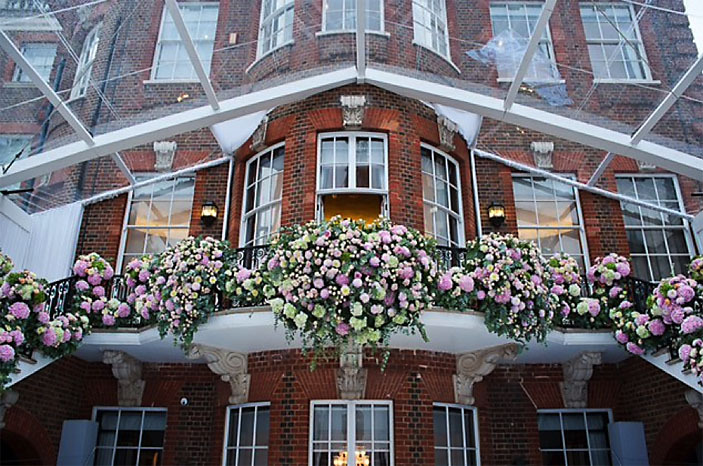 Roses played a lead role in all the floral displays, using a combination of blush pink roses, garden roses, coffee and antique caramel roses, then teamed with dahlias, fluffy hydrangeas and scented white jasmine. Setting the scene, guests were greeted by two 8ft columns to frame the entrance, accompanied by a central arrangement in a large silver urn placed on a mirrored plinth that was filled with our floral collection. For this very romantic ceremony we created a beautiful gazebo marquee structure that was then draped in muslin and dressed with floral borders and floral ties. Perfectly scattered rose petals covered the floor area. Continuing this floral garden wonderland, the reception was held in a garden marquee, which featured a dramatic 12ft diameter circular wreath of roses and hydrangeas that was suspended over the central four tables. This was wow-factor indeed. Large floral bordered mirrors framed the room, where each table was then dressed with a mixture of floral displays. Guests either dined with wonderfully scented rosemary baskets or glass stemmed bowls each filled with an abundant selection of the wedding flowers in the soft floral colour palette, while a trio of roses decorated the chair backs. Around the venue, staircases were draped with generous garlands of flowers that then featured larger floral displays highlighting the sheer beauty of the flowers. Pink is the perfect colour for a wedding as it symbolizes unconditional love. Plus, with so many fabulous shades and flower varieties too choose from it is no surprise that so many blushing brides are requesting me to think pink.